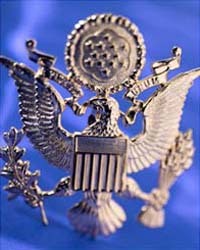 2008 Summer Camps - NEW!! 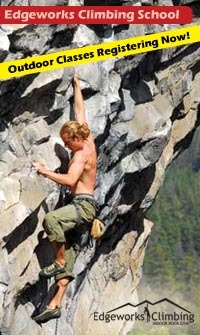 Edgeworks Climbing School - NEW!! Junior Climbing Program 3-6 year olds! - NEW!! 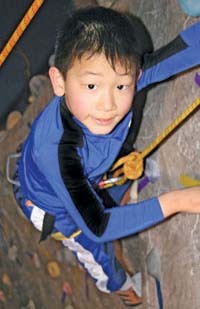 Boy Scout Climbing Merit Badge! Edgeworks Military Night - NEW!! 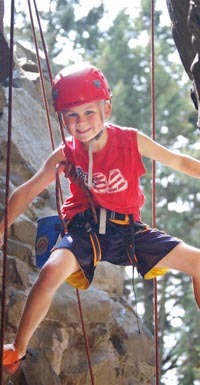 Get your Climbing Merit Badge at Edgeworks! 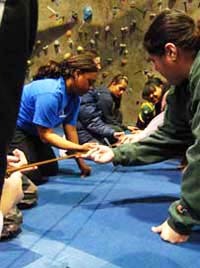 Our BSA counselors teach and explain safety, climbing history, types of climbing, climbing equipment, climbing knots, team work needed to climb successfully, rappelling, and much more. * Reservations: Please call at least two weeks in advance for reservations. Please Call 253-564-4899 to make your reservation today! Edgeworks had it's annual spring competion on April 5th and some of the best top-rope and lead routes were set for it. We have set over 80 new routes since March 1st; come try out the best routes of the year! Fun roof route! It is also our new lead test. Top Rope 18: 5.10- Who Has Returned From The Dead? Very cool route across the whole wall. Very big and improbable stemming. Fun! Another great dihedral stemming problem. Work the roof! Do you need a hairy toe? Big holds, Very Fun, Very Long, Very Hard! Overhung V0 with great feet and hands! What Would Jason Asahara Do? Exterme core tension and big holds. Days are longer, the rain warmer, and snow lines retreating. It's time to get outside. Check out our new and exciting Climbing School Courses: Edge Rock for beginners, Hard Rock for the intermediate, and Master Rock for exploring the vertical backcountry. It's time to get in shape for the outdoor climbing you've been dreaming about all winter. This class will brush up your technique and build endurance to keep the burn away when you're reaching for the next clip.